Currently May and a CCSS Math freebie! It’s officially May! Here that means Apple Blossom, state testing, and that amazing aroma of summer bring right around the corner! Ahh… yes! So close! With the beginning of the month comes one of my favorite Link ups CURRENTLY with Farley at Farley over at OH BOY 3rd grade! I made my currently page early this morning when I was getting ready for work. My jeans had a weird kink in the leg so I through them in the dryer quickly to help out the situation… sadly, the iron was still a necessity! What? Jeans on a Thursday you ask?! Well that leads to the next currently – spring break phase 2! Here in the Shenandoah Valley the Apple Blossom festival is EVERYTHING (I don’t get the allure of it, but then again, I didn’t grow up here!) While I won’t be participating in any of the festivities, I will be enjoying what I like to refer to as spring break part 2! We had 3 days plus a weekend off around Easter, and now we get 1.5 days plus a weekend off for Apple Blossom – add it all up and it’s the week off most of you get! I actually really prefer my break in two parts. Around Easter is really nice and much needed, but to have another 3.5 day weekend right at the cusp of end of year craziness is beyond amazing. AND the weather is supposed to be stellar this weekend! YES! SO…. now I need to get motivated! I have this break and I am planning on changing all the “old” covers in my store to new, fresh, colorful ones. I’m hoping to start that process this weekend… we’ll see how that goes! As far as summer is concerned, I already addressed teh store revamp, BUT I also want to head back down to Williamsburg. I lived there for 8 years and I want to go back and see my friends and colleagues. I think Mr. Dee might enjoy the trip too! And now, because you read all of that and are still here! A present for you! Virginia didn’t adopt the CCSS, BUT I am very aware of all the CCSS craziness going on all around me. 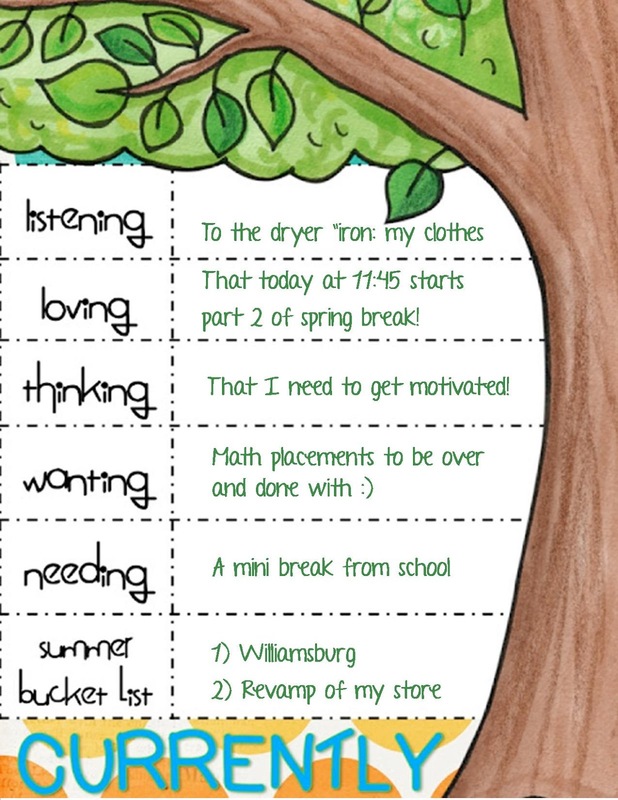 Just recently my dear friend, Jennifer Smith-Sloane aka 4mulaFun and I were chatting, and she was wishing for a CCSS checklist to keep herself organized with her Solve and Snip series. We chatted about how she wanted it to look, and possible ways teachers could use it and then I went to work. A few days later, I sent her the checklists to look over and proof. AND NOW that we’ve made them what we wanted, I’m offering them to you for FREE! There are (currently) three checklists: one for K-2, one for 3-5, and one for 6-8. In the semi-near future I plan to create two more for the High School Common Core Math Standards. Get your FREE K-2 Checklist here, your FREE 3-5 Checklist here, and your FREE 6-8 Checklist here! I hope you find them SUPER DUPER helpful! I found your blog from the the linky. I’m a new follower. Thanks for the freebie! You never let us down—thank you!!! YOU ROCK! Thanks so much for the freebie! It will be very helpful. I found your blog through Currently and am a new follower. Stop by my blog if you get a chance! Thanks for the CCSS math checklist. I am moving to 3rd grade next year, so I needed these.